Carving tool sets aren't for everyone. The more experienced carver will have built up a sound knowledge of the types of tools they are likely to need, and will therefore tend to buy tools individually so that their collection reflects their requirements. With sets, there are usually some very good tools that will get a lot of usage but there will, inevitably, be a few which will stay in the box and hardly see the light of day. Having said all this, there are some sets which are worth considering, with perhaps only the odd one or two tools which will see very little action, so with this in mind, I called in the Micro set from Henry Taylor Tools to see what they were like. The company have an exceptionally good reputation for producing quality precision tools that are hand forged and made with Sheffield steel, so this set arrived with high expectations. The set arrived nicely packaged in a red box consisting of 12 interesting tools: 3mm No.1 straight chisel; 2mm No.2 skew chisel; 3mm No.4 shallow gouge; 5mm No.4 grounding tool; 2.5mm No.5 shallow gouge; 2mm No.6 medium gouge; 3mm No.7 medium gouge; 2mm No.6 medium gouge; 3mm No.7 medium gouge; 2mm No.8 deep gouge; 4mm No.9 deep gouge; 1.5mm No.11 veiner; 1.5mm No.39 V-tool; and 5mm lozenge smoothing tool. The wide range of sweeps and sizes in this collection are based on the vast experience of woodcarver, Jeremy Williams. These tools also came with curved blades and lovely shaped handles, and I was intrigued to see how these would fare on test. I had a work in progress of a relief panel in the workshop, which I thought would make a good piece to try out the various tools. I started off with the more familiar ones, such as the medium gouges, deep gouges, straight chisel and shallow gouge. As I expected, they cut through the lime very nicely and reassuringly so. The curved blades certainly did seem to enhance the way they felt on contact with the timber, and I was able to exert a nice level of control and precision on the cut. The lozenge smoothing tool provided a nice touch to this set; used with an orbital slicing action, this will smooth out rough areas left ragged by tools such as burrs or rasps. The lovely shaped handles felt good in the hand and comfortable over longer periods of use, which is another bonus with these tools. 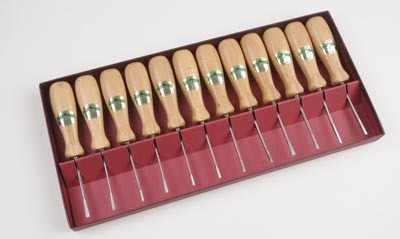 Overall, these tools make a nice set and are particularly good for fine finishing and texturing. 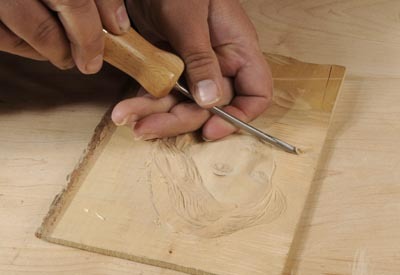 As they are quite specialised in their function, I wouldn't recommend them for the beginner to carving, but they would certainly suit those with more experience in the field.